As I wrote last time (That's enough, CX! ; 2010.3.27), I spent much time in reading 2 Channel’s communication boards related to figure skating the past few days. “2 Channel (2ch)” is the world’s largest Japanese Internet forum in which a lot of Japanese netizens (network citizens) gather. People in the figure skating boards use nicknames for major skaters, and some of them really amused me. I’m going to introduce my selection! I start with Japanese team. Nobunari Oda: ‘Tono (liege)’ Yah, he is the 17th direct descendant of Oda Nobunaga. Takahiko Kozuka: ‘Kozu-Kozu’ It sounds pretty. Akiko Suzuki: ‘Akko’ or ‘Akko-chan’ We often add chan affectionately after someone’s name. Evan Lysacek: ‘Black Pole’ or ‘Lysa’ Ha-ha! He is so black and spindly this season. Johnny Weir: ‘Johni-ko’ or ‘Joni’ Ko is often used in the last part of women’s name in Japan. Sounds feminine. Jeremy Abbott: ‘Abbo’ or ‘Abbo-Abbo’ Now we can see some rules for making nicknames. Adam Rippon: ‘Rippon-pon’ That’s a breaking ball. Rachael Flatt: ‘Shyatyo (boss)’ Japanese men think this adorable girl looks like a typicalcompany-president face…. Patrick Chan: ‘P-chan’ A big mouth, but he might be loved. Joannie Rochette: ‘Aniki (big brother)’ She’s a name for a handsome woman. Stéphane Lambiel: ‘Shimauma (zebra)’ or ‘Lambi’ Ah, I can vividly remember his blouse. Kevin van der Perren: “KVDP” Hmm... It’s another pattern. Jenna McCorkell: ‘Yome (his wife)’ I like this one and wish I could give the nuances of this Japanese word. Elene Gedevanishvili: ‘Gete-ko’ or ‘Gete-ko-chan’ She is always one of skate fans favorite. Adrian Schultheiss: ‘ADSL’ Yah, Kevin’s pattern. Ksenia Makarova: “Macaron” That’s sweet. Kiira Korpi: “Fujin (lady of quality)’ Let’s open the ball! Evgeni Plushenko:‘Kaityo (representative)’ Of course, the Quad Union! I want to show every figure skating fan in the world this accursed building. This is a premise of Fuji Network (CX), the world's most stupid TV station, which doesn’t broadcast ladies SP and LP at World Figure Skating Championships 2010 live on television. If I remember correctly, I'm in one of the world's leading figure skating countries, and Japan sends excellent skaters including contenders for the gold medal to the competition. Last night, last half of ladies SP started at 9:30 p.m. Japan time, and I watched it on an Estonian streaming TV (like a picture-card show), reading posts on an interactive BBS of 2 Channel to check what was happening while the screen was frozen. During Mao Asada’s performance, the station was sending the video of Daisuke Takahashi’s LP in their usual sports highlight show. Excuse me…. Damn! Damn! Damn! They will broadcast the recorded SP at 7:00 p.m. in this evening and the recorded LP at the same time tomorrow. First group of ladies LP will start at 8:30 p.m. Japan time today while the idiot will be sending the video of SP on the air. I’m going to repeat the ridiculous streaming-and-BBS work tonight. I hope the station never ever buys figure’s TV rights again. When and where do you feel like that? 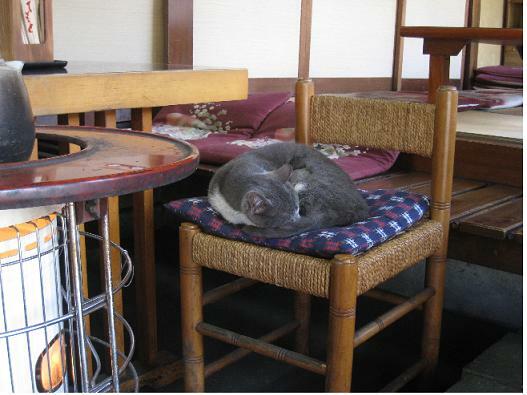 I felt that moment at a soba-noodle shop, Shioya(志おや) in Yunishigawa. When I entered the shop, I saw a long-forgotten oil heater and then found a cat enjoying a good sleep beside it. I kept the shop people from waking the cat up and took a seat. I looked over the space with keen nostalgia. Everything in the shop made me feel like I’d slipped back into the Showa Period before 1970’s. I don’t mean the shop was tattered and antique but actively working Showa. Everything was maintained in original state. The snow piled up outside; the unspoiled space was warm and cozy. The beer was chilled; the soba noodles were hot and tasty. The cat still slept all curled up. I was as happy as I could be. 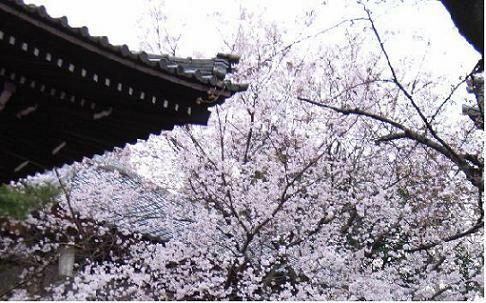 On March 22nd, the Meteorological Office declared that cherry blossoms had opened in Tokyo. This is one of cherry trees on the grounds of a temple nearby. It’s only a blossoming tree. The others have only partially blossomed so far. I heard in Tokyo they will be in full bloom in 8 ~ 9 days. Let's stick around your house or office and enjoy the blossoms! The village is located deep in the mountains, but there are over 30 accommodations including large modern inns, traditional Japanese inns and small guesthouses. All accommodation owners connecting by blood or marriage have a united effort to develop the tourist industry. In this established hot spring resort I stayed at a relatively large four-star class inn, which is inexpensive on weekdays. Overall, I was greatly pleased with it. Room: I chose a standard room (an anteroom, an eight-mat room, a sitting area, a washroom, a bathroom, and a toilet) with a good view of the mountain stream. A building wasn’t new, but the room was clean and in good condition. Bathing areas: There were 3 common areas (24 hours main one, the outdoor hot tub along the mountain stream, and the other spacious one). A chartered bathroom was also available. I think the benefit of large inns is enriching of bathing areas. On the negative side, many of those filter and circulate the water for their hot spring baths including the inn, and at worst I confuse hot spring water with tap water. However, in Hana to Hana hot spring water quality in some of bath tabs was good enough. 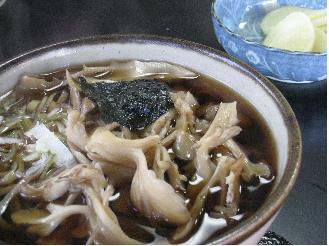 Dinner: I enjoyed the local specialty, “Okariba-yaki (in-the-field dish for hunting parties)”. Guests sit by Japanese fireplace, “irori” and grill stream fishes and vegetables on charcoal by themselves. Local sake was nice! I’m a hot spring enthusiast and fond of the drink and dining. 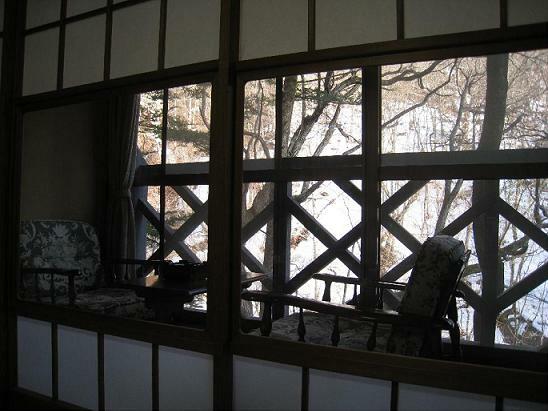 A Japanese hot-spring inn is an ideal place to enjoy them at a time! I visited Yunishigawa (湯yu: hot water, 西nishi: West, and 川gawa: liver) with my friends and stayed there 2 nights from last Tuesday. I really love the place. I’d like to introduce this Xanadu to you in several batches. This time I’ll write about its historical background. 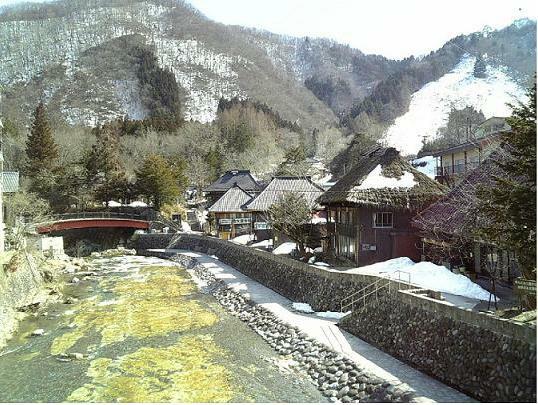 Yunishigawa located in a mountainous area in Tochigi Prefectures is one of popular hot spring resorts in North Kanto. It has a unique and distinctive history. The locals believe their ancestor is fleeing Heike warrior. 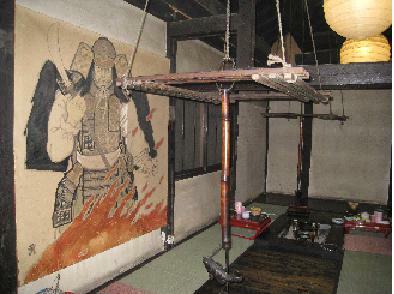 “Heike“ or “Taira clan” was major samurai clan whose ancestors were Emperors. The clan had once been at the height of its prosperity, but it was destroyed by Genpei War (1180-85) with another clan. It is said that after the last battle, Heike warriors and families fled in disarray to shake off their pursuers and settled in deep in the mountains. We call this story the legend of fleeing Heike warrior, and there are many villages whose residents claim to be descendants of Heike in various regions of Japan. The legend sounds possible, but no one knows which village is genuine or not. It was first time for me to visit the legendary place, and I was deeply impressed by the locals claiming a family lineage stretching back to Heike. They have followed in a long line of Heike’ s culture and way of living. For example, even now they don’t fly “carp streamers” since they hear that their ancestors were found by pursuers because of carp streamers, which were put up in mountain retreats in the late twelfth century. The word of Heike reminds me of the opening lines of “The Tale of the Heike”, which tells the story of the rise to glory and eventual downfall of the clan. Its theme is based on the Buddhist concept that the proud will surely be destroyed. I liked these lines in my high school days even though I was a typical teenager obsessed with a boyfriend and MTV. I’ll introduce them in Japanese and English. The sound of the Gion Shoja bells echoes the impermanence of all things; the color of the sara flowers reveals the truth that the prosperous must decline. The proud do not endure, they are like a dream on a spring night; the mighty fall at last, they are as dust before the wind. Translated by McCullough H. C. (1988). The Tale of the Heike. (pp. 23). Stanford CA : Stanford University Press. I checked several English versions, and this is best of them. 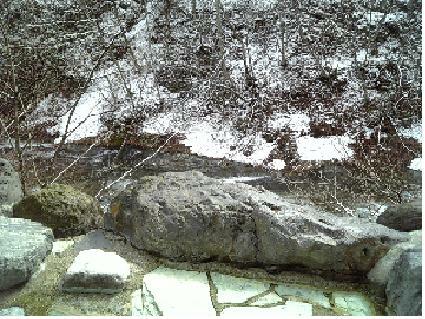 I’ll write about a hot spring inns where I stayed nest time! When Formula One Bahrain GP program was going on last night, I found there was something wrong with left side of my throat. By looking in a mirror I saw swelling of the throat. I had no pain, but it was considerably swollen. I’m 155 cm tall and weigh 46 kg, but only left side of my face line looked like Ms. Susan Boyle. I abandoned watching Schumacher and got into bed with a feeling of anxiety. I went to a clinic nearby first thing in the morning. Now I know I have salivary gland swelling. An old woman doctor said she couldn’t identify the cause from my symptoms: no pain, no fever, no cough, no irritation above the larynx, and just an enlarged salivary gland. She also said it might not be a critical illness needs medical attention. The sign of the clinic says “internal medicine, dermatology, pediatrics, and otolaryngology”. I chose the clinic because I used to go there in my childhood and know there is the ear, nose and throat specialist (I was glad she’s looking well). The other doctor covers rest of the departments, but if I need to see a dermatologist, I wouldn’t go there. In Japan, when a doctor starts a clinic (doesn’t have a hospital bed) he or she can put any treatment departments on the door as he or she likes. Many doctors add unprofessional departments (e.g. internal medicine and dermatology) to their menus to get patients widely. I always infer a doctor’s profession from his or her list based on what I hard form my physician friend. In many cases, doctors put their specialized areas on the first line. If you see “internal medicine and dermatology”, the doctor should be an internal medicine specialist. If they are in a reverse order, the doctor should be a dermatologist. However there are exceptions. If you see “internal medicine, cerebral surgery, and surgery” or “internal medicine, orthopedics, and surgery”, the doctor must be a brain surgeon or bone specialist. Even a clinic, which has multiple departments like described above, a doctor in general practice can examine conventional diseases and often be a nice family doctor. Undesirable case is a jumble of unrelated departments, for example, “orthopedics, surgery, internal medicine, dermatology, plastic surgery, and pediatrics”. In this case, I have to think of the doctor is an irresponsible bone specialist. Don’t bring your children to this kind of clinic. The swelling is going down with luck, but still my face is puffy. One of my superiors at work is a Trekkie. I saw him yesterday and remembered a rumor that he has a huge collection of the Star Trek character figures. 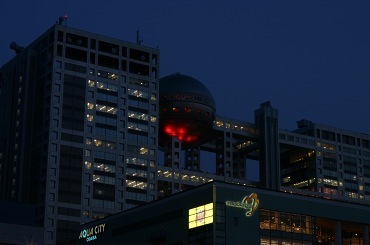 The Original Series was broadcasted in Japan from 1969 to 1974, thus he probably saw it with excitement in his teenage. I’m not interested in this American science fiction entertainment series in general. However I saw many episodes of Star Trek Voyager few years ago on cable TV. So I liked it. Why? Now I come to think of it. One reason is Voyager’s plot in which the aim of the voyage was to return to Earth. It was unique. I don’t like the ideas such as ‘a bold adventure’ and ‘to go where no man has gone before’, which were typical missions of the series. Not that again. Someone or something might live there peacefully. The other reason is the appeal of the characters in Voyager. In particular, Captain Kathryn Janeway was superb –strong, highly capable, stay in control, and humane. I’d like to work for her if I had a chance :D. It was nice that the key concept of the characters was a minority or non-mainstreamer: a female captain, aliens, former rebels, and a medical hologram. I’ve never speculated about the SF drama. The Vancouver Olympics bronze medalist in men's figure skating, Daisuke Takahashi will receive the People’s Honor Awards from Okayama Prefecture and Kurashiki City (Yomiuri Online). He went through many hardships since then. Recently he's not only improved his skating skills (except the quad), but also he’s matured as a person and man. I'll be excited because I’ll be able to see his programs again at the world championships in Torino. The kid has really turned out well. Do you want to take a hot bath? Most Japanese love soaking a bathtub, and I sure do love that. Though I have a bathtub at home, I prefer a spacious bathroom and often go to a public bathhouse, “sento” (Dr. Wikipedia details it). My favorite sento nearby has a sauna (extra cost), and I always spend about 2 hours taking the sauna and sitting in a nice hot water every Sunday evening. In most sentos some older persons who frequents have been a sort of autocratic Empresses :D. Those regulars gave me sento etiquette training in my elementary school days. They are rulebooks. Lately I’ve noticed that Empresses are having a hard time with newcomers of their generation. The newcomers are not familiar with sento etiquette. They come to bathhouses because they get free tickets, which Local Governments give them as part of health promotion activities for the elders. Unfortunately, sometimes conflicts occur between them =). The problem is the water temperature. In a sento in downtown Tokyo bath temperature is very high - between 43 and 45 degrees C (109~113 degrees F), and regulars love a very hot bath. Besides common rules for a communal bath (e.g. wash one’s body with soap and then rinses oneself thoroughly before dipping into a bathtub), there are local rules differ from region to region and sento to sento. One of the local rules is about how to take this very hot bath. If there are two separate tubs, you can add water only one of them (let’s ask a grandma). However, you must never try to adjust an entire tub to your suitable temperature. The right way is that under a running faucet you dip into under the faucet where the temperature of water drops. Then, when you soak up to your shoulders, turn the faucet off as quick as a flash. If bathtubs seem separate, they are continuous at the bottom. Don’t forget Empresses desire a very hot bath, and adding water effects on the other tub. Some newcomers who don’t know or just ignore this rule add too much water into a bathtub. When Empresses give them a mild verbal reprimand, it sometimes creates an explosive situation. They don’t have a quarrel but start whinging. At an unfortunate time I’m told complaints from both sides. Empresses point out the newcomers’ rudeness, and the others say the regulars don’t know too hot water is dangerous to health. I don't really care either temperature…. Come on, grandmas! I just want to relax and enjoy my bath time. Tokyo Notebook is written by Kinakinw, a Japanese woman living in the Tokyo metropolitan area. Primarily, I’m starting this blog to write something in English for non-work purposes. In my work all documents needed are formal and objective writing such as research papers. I therefore want to write about various topics casually here without much regard for grammar mistakes. Secondly, I’m hoping nonnative readers of Japanese sense lifestyles and attitudes of ordinary Japanese people in Tokyo through my articles about everyday affairs and topics including food, drink, travel, hot spring, pet, et cetera. For timesaving, I’d like to give bare essentials of explanations about things unique to Japan if there are referable sites in English. Just run a word in quotations (ex. “sushi”) through search engines. Thank you. Welcome to Tokyo Notebook! Have Fun!